How to access my O365 account through the web? By simply using a Web browser (Internet Explorer, Google Chrome, Firefox, etc. ), you can access your Office 365 (O365 hereafter) Exchange Online account through the web, and access your O365 mailbox with Outlook Web App (OWA, the Webmail for O365 Exchange Online). For security and functionality, you are strongly recommended to use the most up-to-date web browser that is compatible with your operating system. If you use other Web browsers that not listed above, you will access your O365 mailbox with Outlook Web App opening in the light version, which provides fewer features for you to access your O365 account and mailbox. 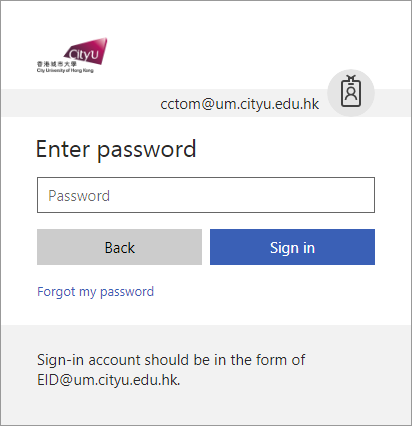 You can access your O365 Exchange Online account by directly go to the following CityU Staff O365 "Sign in" page at http://mail.office365.com/cityu.edu.hk. You can also get to this Sign In page by selecting ". cityu.edu.hk" under "Web Logon to University account" from the CityU Email Servics home page at http://email.cityu.edu.hk. 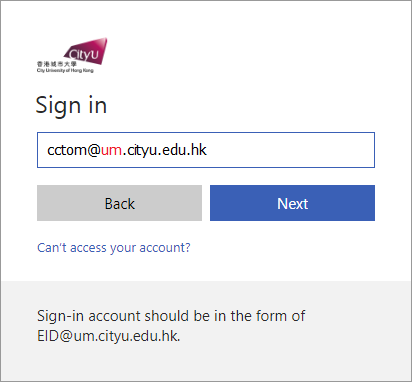 Specifiy your O365 account" in the form of "EID@um.cityu.edu.hk" (e.g. "cctom@um.cityu.edu.hk") as shown below, then click [Next]. Enter your account password. Then click the [Sign in] button to login your O365 Exchange Online account. 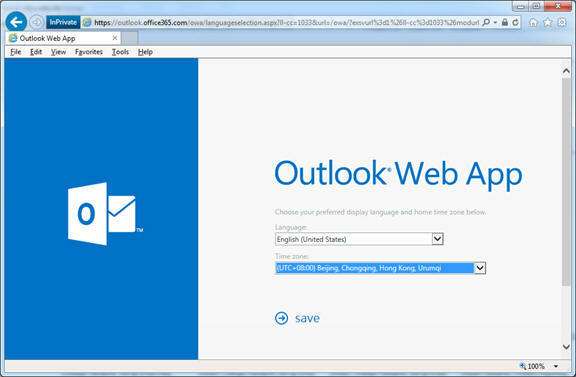 For first time signing in Office 365 OWA, you will be prompted to select "Language" and " Time zone". Click "save" to save your choice, as shown below. 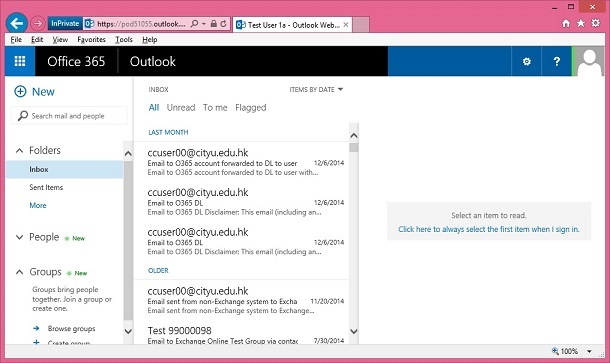 Your Inbox will be displayed in the OWA as shown below. Click (or tap) a tile to go to that app or service. For example, you might choose Outlook to go to your email, or OneDrive to go to your OneDrive for Business library. 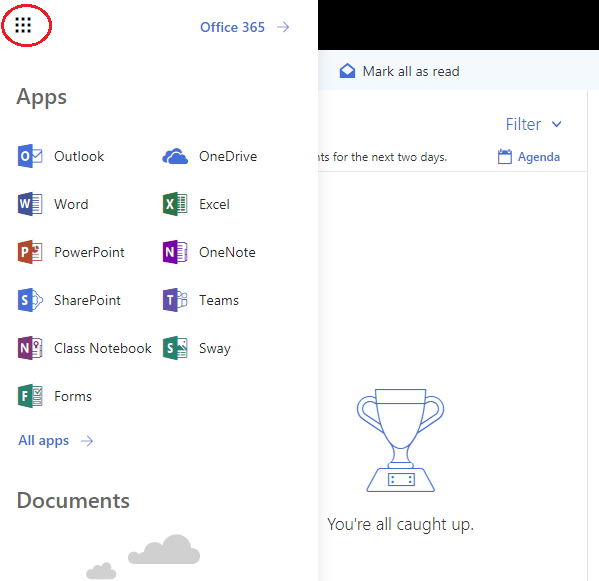 More information regarding the use of App launcher and other latest changes in Office 365 can be obtained at Find help for the latest changes in Office 365. 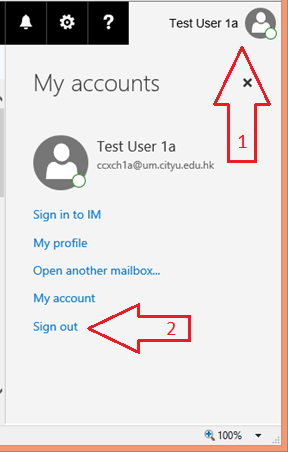 When you finish using your mailbox, always remember to Sign out your account with the following steps. Signing out helps prevent someone else from using the computer to access your mailbox. Click your account at the top-right corner of OWA window.